Comfort has a big impact on whether we get a good night sleep when on a hiking trip. For each of us there is a list of things that will enhance or detract from our perception of comfort. For me the factors include being not too warm (or too cool), the ability to roll over easily (without getting wrapped in my sleeping bag), being ‘covered’ and having a clean place to lay my head. Those of you who don’t use a sleeping bag liner should think deeply about this last point. Your sleeping bag does get dirty and it is a complex exercise to clean and for the durability of the sleeping bag, you shouldn’t repeat too often! And the best way to protect your treasured sleeping bag is to use a sleeping liner. 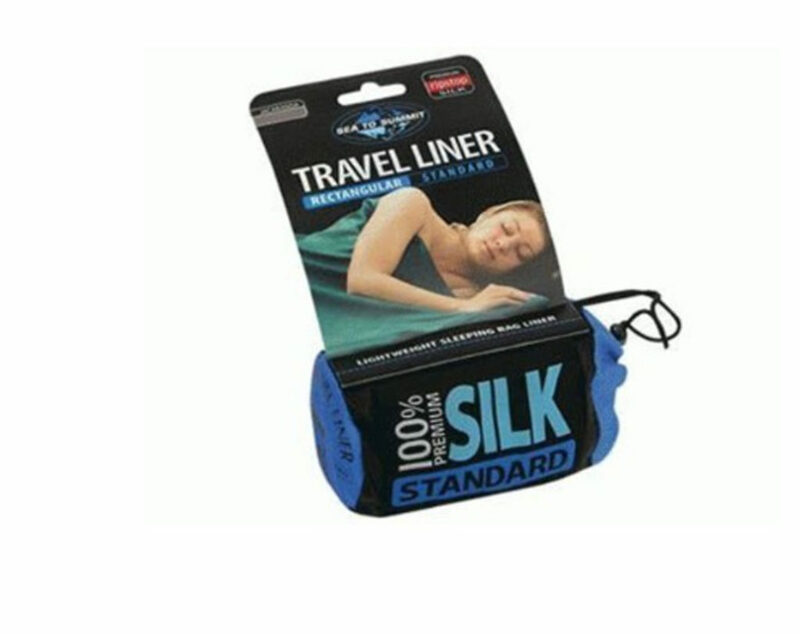 I have been using a Sea to Summit Silk Travel Liner for years and highly recommend them. Given they are made from silk, they are lightweight – weighing in at 130 grams – and provide benefits and the comfort factors to make sleeping on the trail much more enjoyable. These liners are made from 100% silk so they feel very good against your skin. The liners come with a storage bag that packs them down to a compact size – 10 x 5 cm. They are easy to use – all you do is unroll the liner from the carry bag and lay it inside your sleeping bag. Placed inside your sleeping bag, the liner will provide an extra insulation layer to keep you a little warmer. In warm weather, you can just sleep inside the liner without using a sleeping bag – good for me because even in the hottest weather, I need to be covered! The only negative is that on warm nights, the silk can feel a little ‘clammy’ or ‘sticky’ against your skin. These silk liners come in a few different colours but the easy to get colours are blue and green. I have the ‘Standard’ length at 185 cm (in purple of course) and Tim has the ‘Long’ version in green which is 210 cm in length. However, there are also a few other versions including a ‘Double’ version and a ‘Mummy’ version with or without a hood. The new versions also have stretch panels which allows the liner to stretch and move with you as you sleep. When we think of silk we usually think of very delicate fabrics that don’t withstand heavy wear. Our Sea to Summit Silk Travel Liners are now more than ten years old and have handled some very heavy wear. If you consider the price in the context of the time over which they have been used, the heavy wear they have received and the fact that these liners are still going strong, then they represent very good value for money. I regularly use my Sea to Summit Silk Travel Liner and will continue to do so!